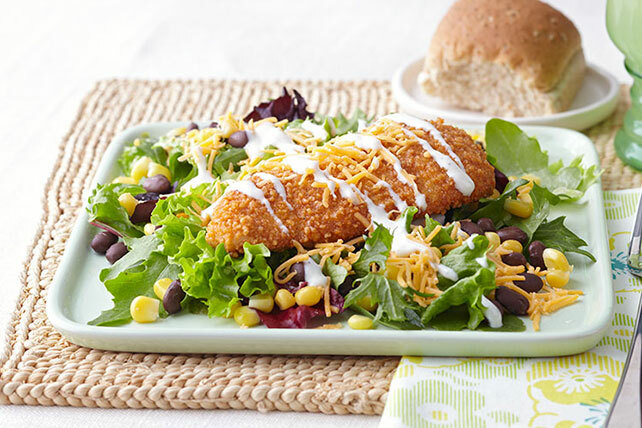 Trying to stick to your healthy eating plan but really want some crispy chicken? You’re in luck. This flavor-filled salad lets you enjoy the crunch smartly. Measure 1/3 cup coating mix; coat chicken with coating mix and bake as directed on package. Toss greens with corn and beans in large bowl. Top with chicken, cheese and dressing just before serving with rolls. For a quick burst of flavor, sprinkle unused SHAKE 'N BAKE Coating Mix over hot cooked vegetables or salads. Add chopped tomatoes and thin red onion slices to the salad. Prepare using SHAKE 'N BAKE Hot & Spicy Seasoned Coating Mix for Chicken or Pork.